AK Tyagi, Nuberg EPC, India, takes a detailed look at the production of sulfur and provides a case study on a plant installation in Egypt. 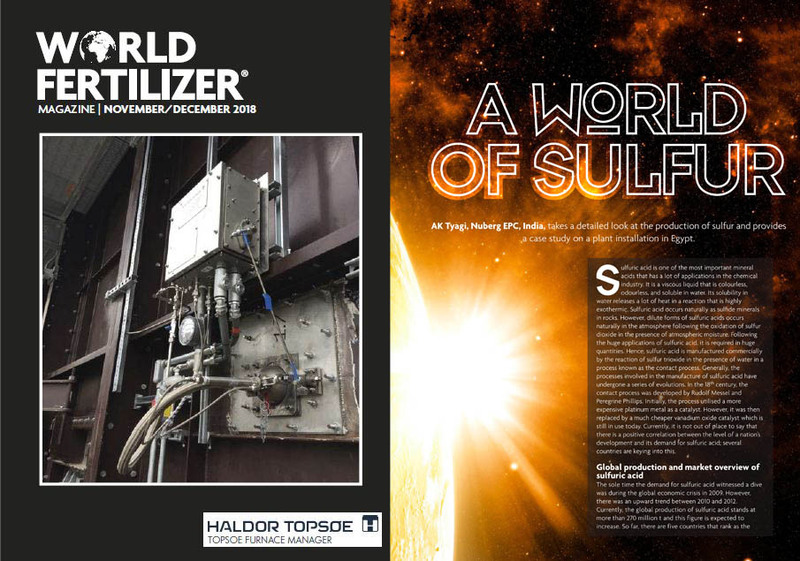 World Fertilizer Magazine, November 2018. Sulfuric acid is one of the most important mineral acids that has a lot of applications in the chemical industry. It is a viscous liquid that is colourless, odourless, and soluble in water. Its solubility in water releases a lot of heat in a reaction that is highly exothermic. Sulfuric acid occurs naturally as sulfide minerals in rocks. However, dilute forms of sulfuric acids occurs naturally in the atmosphere following the oxidation of sulfur dioxide in the presence of atmospheric moisture. Following the huge applications of sulfuric acid, it is required in huge quantities. Hence, sulfuric acid is manufactured commercially by the reaction of sulfur trioxide in the presence of water in a process known as the contact process. Generally, the processes involved in the manufacture of sulfuric acid have undergone a series of evolutions. In the 18th century, the contact process was developed by Rudolf Messel and Peregrine Phillips. Initially, the process utilised a more expensive platinum metal as a catalyst. However, it was then replaced by a much cheaper vanadium oxide catalyst which is still in use today. Currently, it is not out of place to say that there is a positive correlation between the level of a nation’s development and its demand for sulfuric acid; several countries are keying into this. The sole time the demand for sulfuric acid witnessed a dive was during the global economic crisis in 2009. However, there was an upward trend between 2010 and 2012. Currently, the global production of sulfuric acid stands a t more than 270 million t and this figure is expected to increase. So far, there are five countries that rank as the leading producers of this chemical. Leading the chart is China, whose production output stands at more than 74 million t. The US sits second with more than 37 million t, India produces 16 million t, Russia accounts for 14 million t, and Morocco produces 7 million t of the world output. Generally, these five countries account for approximately 61.5% of the global production of sulfuric acid. Currently, the fertilizer industry consumes more than 55% of the world output. At this rate, there is no doubt that the need for sulfuric acid cannot be overemphasised. In 2016, the global sulfuric market was valued at US$10.1 billion. It is estimated that this figure will reach US$15 billion by 2025. Likewise, it is anticipated that the global demand is rising exponentially, while there is a need for an increase in production to meet this demand. 10% sulfuric acid (dilute sulfuric acid). 29 – 32% sulfuric acid. 62 – 70% (chamber acid/fertilizer acid). 78 – 80% (tower or glover acid). India is one of the major producers of sulfuric acid in the world. As already mentioned, there is a positive correlation between the level of consumption of sulfuric acid in a country and its per capita income. So far, India utilises the majority of its sulfuric acid in the production of fertilizers. The process involves the acidulation of rock phosphates, as well as the production of ammonium sulfate. Other industrial applications include petroleum refining, steelworks, and other inorganic chemicals. Currently, there are more than 65 sulfuric acid plants spread across India. The major raw materials used in the manufacture of sulfuric acid include elemental sulfur, hydrogen sulfide, pyrites, etc. Nearly all factories in India rely heavily on elemental sulfur as the major s ource of raw material. The extraction of pure elemental sulfur from its ore. The conversion of elemental sulfur into sulfur dioxide in the presence of oxygen. The conversion of sulfur dioxide into sulfur trioxide. The conversion of sulfur trioxide into sulfuric acid. Hot sulfur dioxide is passed into the lead chamber from the Glover tower. Afterwards, it is washed using nitrous vitriol. Sulfur dioxide is then oxidised to sulfur trioxide. This is then dissolved in acid wash resulting in the formation of Glover acid, which is approximately 78% sulfuric acid. At this point, the glover tower contains a mixture of gases, such as oxygen, nitrogen, nitrogen oxides, sulfur dioxide, and steam. All these are then passed through the lead chamber where they further react with water to form sulfuric acid. This is then collected on the floor of the chamber. The lead chamber has a series of chambers ranging from three to 12. The gases produced are often referred to as chamber acid or fertilizer acid, and contain between 62 – 68% sulfuric acid. Lastly, the unreacted sulfur oxide and nitrogen oxides are recycled as the process is repeated again. The summary of the process is shown in Figure 1. Extraction of sulfur: the majority of elemental sulfur is obtained from its respective metal sulfide. Sulfur dioxide is obtained by roasting the respective metal sulfide ores in air. It can also be obtained from hydrocarbons. In cases where elemental sulfur is used directly as the feedstock, it must first be converted to sulfur dioxide by burning in the air. This reaction is carried out at a very high temperature (1300 K) and the resulting gas contains approximately 10% oxygen and 10 – 12% sulfur dioxide. This is then cooled to approximately 700 K in water. Conversion of sulfur dioxide to sulfur trioxide: the conversion of sulfur dioxide to sulfur trioxide is an exothermic reaction. Typically, a plant contains a cylindrical vessel that functions as a fixed bed reactor. The reactor has four beds of catalysts referred to as a converter. It is heated to 700 K and serves as the inlet for the sulfur dioxide and oxygen. The entire conversion process takes place in the presence of vanadium (v) oxide catalyst. The reactor temperature of 700 K is not enough to melt the vanadium (v) oxide catalyst. As a result, cesium pellets are added to function as promoters thereby lowering the melting point of the catalyst. Conversion of sulfur trioxide to sulfuric acid: this is the last stage of the conversion process. It involves the reaction of sulfur trioxide with water to produce sulfuric acid. The process requires utmost precaution as it results in the formation of sulfuric acid fog. Hence, rather than add water directly, the sulfur trioxide is first absorbed into concentrated sulfuric acid resulting in the formation of oleum. Afterward, the oleum is mixed with water to form sulfuric acid. The application of sulfuric acid is not limited to the fertilizer industry. It fi nds a useful application in several another chemical processes. However, there is no doubt that a greater percentage of global sulfuric is used in the manufacture of fertilizers. 100 million tpy of phosphate rocks are processed using the wet method involving sulfuric acid. The result is the production of phosphoric acid or the resulting calcium salts. In a typical process, fl uorapatite is treated with sulfuric acid to produce phosphoric acid, hydrogen fl uoride, and calcium sulfate. In another reaction, phosphoric acid can also be converted to ammonium phosphate which is another important fertilizer. Likewise, the reaction of sulfuric acid and ammonia resulting from the thermal decomposition of coal results in ammonium sulfate. Following the increasing need for agricultural products across the world, there is no doubt that the fertilizer industry still remains the highest consumer of sulfuric acid globally. The production and application of sulfuric acid can result in serious deleterious effects. So far, the industrial process is the major source of sulfuric acid related pollutants. These include the manufacturing process, its application in the production of fertilizers, smelting of metals, refi ning of petroleum, lead-acid accumulators, and other processes. These processes result in the emission of SO2 into the atmosphere. Even though the concept of climate change is still a huge controversy, there is no doubt that the effects of SO2 emissions can be catastrophic. SO2 emissions are the major cause of acid rain. In the short term, this could result in the contamination of plant and animal life. In regards to human contamination, sulfuric acid can be inhaled or absorbed through the skin resulting in serious burns. Thus, there are strict regulations regarding SO2 emissions globally. There is also the need to create a balance between the needs of the fertilizer industry as well as minimising the emission of SO2. 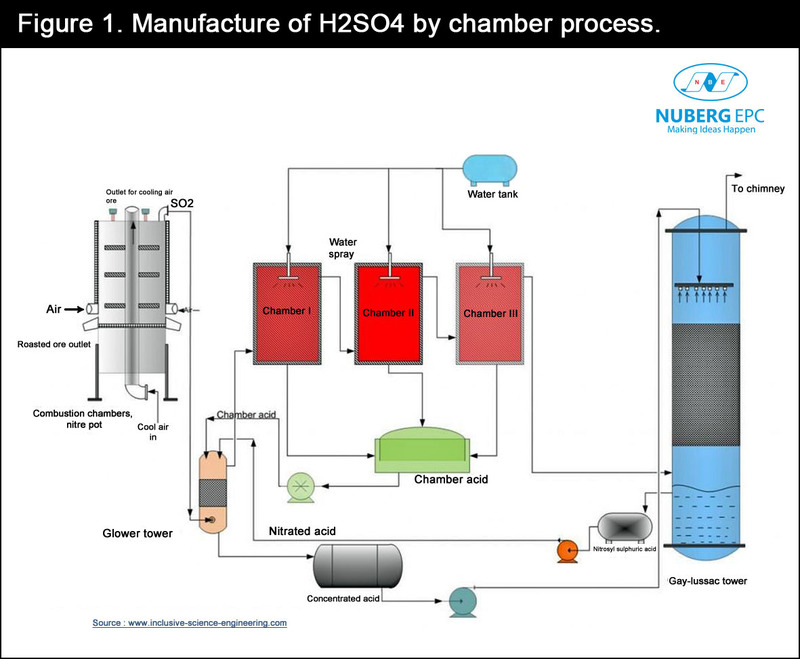 Therefore, Nuberg EPC has improved the confi gurations of sulfuric acid production plants to handle emissions and other forms of environmental contaminations associated with the production of sulfuric acid. 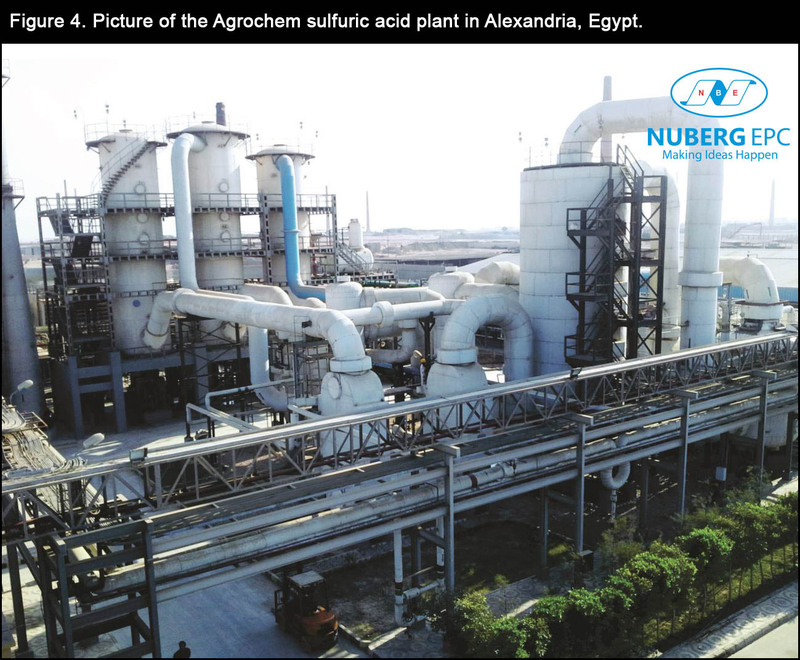 Since 1996, Nuberg EPC has successfully commissioned several sulfuric acid plants across the globe: one of them is situated in Egypt for Agrochem. This case study shares the insights and challenges faced throughout the entire process. Plant capacity: 300 tpd (98% sulfuric acid). The company reached out to Nuberg EPC relaying its desire to construct a brand new sulfuric acid plant in Egypt. Nuberg EPC took immediate action with shop drawings and basic and detailed engineering surveys of the proposed site. Afterwards, the company sourced suppliers to procure the best materials for the project. The scope of the project included process, technology know-how, basic and detailed engineering, design, procurement, manufacture and supply of plant equipment including complete erection, construction, project management, commissioning, and startup of the plant. After several months of hard work, the plant was successfully commissioned in 2012 and currently operates on double contact double absorption (DCDA) technology. The scope of the project includes the EPC and LSTK of a 300 tpd sulfuric acid plant. An overview of some of the key equipment and machinery for the project is presented below. Preparation of the list of equipment. Preparation of flow diagrams and configuration finalisation. Sequence diagram; process description; single line diagram; P&I diagram; instrument list, etc. Layout and piping materials (metallic and plastic). Site supervision for the erection and commissioning. Close monitoring of critical activities to ensure compliance. The use of bar charts and critical path method (CPM) to indicate every activity of the project. Coordination with clients and vendors during the detailed engineering. Procurement and delivery progress control. Preparation of monthly progress reports and with comments on compliance or deviations. 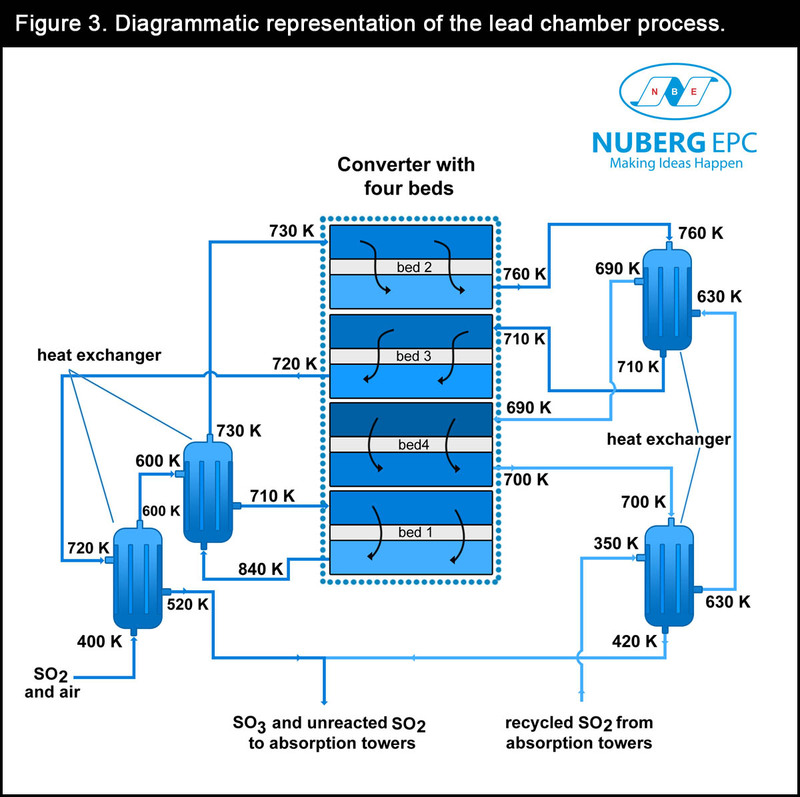 The Nuberg EPC process for the production of sulfuric acid is in line with the contact process already described. The process involves using vanadium pentoxide (V2O5) as the catalyst. 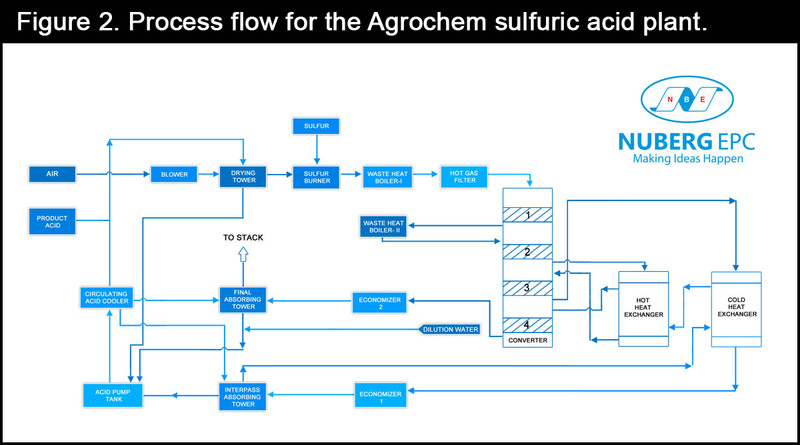 The process fl ow for the Agrochem plant is shown in Figure 2. Commissioned in 2012, the Agrochem sulfuric acid plant in Alexandria is the fi rst turnkey project executed by Nuberg EPC in Egypt. Based on DCDA technology, the plant produces sulfuric acid (98%) used mainly in the fertilizer industry in Egpyt. Nuberg EPC provided plant engineering and construction services that helped Agrochem to run a safe, reliable, and environmentally friendly plant. The project scope included engineering, technology know-how, global procurement, and construction of all process facilities, including a sulfuric acid plant, utilities, storage, and other required units. Sulfuric acid is one of the most commonly used industrial chemicals in the world. In the last few years, growth in the sulfuric acid market has been driven by fertilizers using phosphates, such as diammonium phosphate (DAP), monoammonium phosphate (MAP), triple superphosphate (TSP), and single superphosphate (SSP). With the growing demand in agriculture, infrastructure, metal processing activities, and usage in chemical synthesis such as hydrochloric acid, synthetic detergents, nitric acid, dyes and pigments, and sulfate salts, the sulfuric acid market is expected to grow further. This article was first published in World Fertilizer Magazine in November/December 2018.